James B. 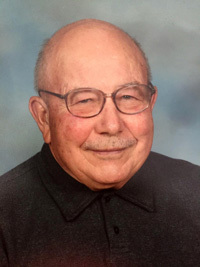 "Jim" Schneider Sr., 88, of Benson passed away Friday (Feb. 1, 2019) at the Apostolic Christian Nursing Home, Roanoke. Visitation will be from 1 to 3 p.m. Sunday at Knapp-Johnson-Harris Funeral Home, Roanoke. His funeral will be at 2 p.m. Monday at St. John's Catholic Church, Benson. Deacon John Nelson will officiate. Burial will be at St. John's Catholic Cemetery, Benson. Jim was born May 18, 1930, in Bloomington, to John and Rose Hindert Schneider. He married Suzanne Bradle in Eureka on Nov. 19, 1959. She preceded him in death on June 14, 1988. He is survived by five children, James Jr. (Joni), Long Grove, Iowa; Mary (Steve) Carls, Gridley; Andy, Bentley, Mich.; Greg (Kim), Roanoke; and Joe (Brenda), Benson; seven grandchildren, Amanda (Brandon) Smith, Rachel (Zac) Pearson, Jacob (Molly) Carls, Abby Schneider, Anna Schneider, Jamie Schneider and Sadie Schneider; and three great-grandchildren, Lyla Pearson, Bryer Carls and Addison Smith. Also surviving are three brothers, Louis Schneider, Flanagan; U.J. (Ruth) Schneider, Bloomington; and Frank (Mabel) Schneider, Paradox, Colo., as well as numerous nieces, nephews, great-nieces and great-nephews. He was preceded in death by his wife, Suzanne; his parents; four brothers, Edmund "Bud," John Jr. "Zip," Francis "Ollie," and Leland "Squirt"; and two sisters, Emily Schneider and Mary Seifert Gebhards. In lieu of flowers, memorials can be made to Benson Ambulance Squad, Benson American Legion, the German American Central Society in Peoria, and St. John's Catholic Church Building Fund. Condolences may be sent to the family at knappjohnsonharris.com.